A minor planet is an astronomical object in direct orbit around the Sun (or more broadly, any star with a planetary system) that is neither a planet nor exclusively classified as a comet. [a] Before 2006 the International Astronomical Union (IAU) officially used the term minor planet, but during that year's meeting it reclassified minor planets and comets into dwarf planets and small Solar System bodies (SSSBs). Minor planets can be dwarf planets, asteroids, trojans, centaurs, Kuiper belt objects, and other trans-Neptunian objects. As of 2018, the orbits of 789,069 minor planets were archived at the Minor Planet Center, 523,824 of which had received permanent numbers (for the complete list, see index). The first minor planet to be discovered was Ceres in 1801. The term minor planet has been used since the 19th century to describe these objects. The term planetoid has also been used, especially for larger (planetary) objects such as those the International Astronomical Union (IAU) has called dwarf planets since 2006. Historically, the terms asteroid, minor planet, and planetoid have been more or less synonymous. This terminology has become more complicated by the discovery of numerous minor planets beyond the orbit of Jupiter, especially trans-Neptunian objects that are generally not considered asteroids. A minor planet seen releasing gas may be dually classified as a comet. Objects are called dwarf planets if their own gravity is sufficient to achieve hydrostatic equilibrium and form an ellipsoidal shape. All other minor planets and comets are called small Solar System bodies. The IAU stated that the term minor planet may still be used, but the term small Solar System body will be preferred. However, for purposes of numbering and naming, the traditional distinction between minor planet and comet is still used. Hundreds of thousands of minor planets have been discovered within the Solar System and thousands more are discovered each month. The Minor Planet Center has documented over 199 million observations and 789,069 minor planets, of which 523,824 have orbits known well enough to be assigned permanent official numbers. Of these, 21,787 have official names. As of 26 October 2018[update], the lowest-numbered unnamed minor planet is (3708) 1974 FV1, and the highest-numbered named minor planet is 518523 Bryanshumaker. Sednoids, detached objects with perihelia greater than 75 AU (Sedna, 2018 VG18 and 2012 VP113). Out of a total of more than 700,000 discovered minor planets, 66% have been numbered (green) and 34% remain unnumbered (red). Only a small fraction of 20,071 minor planets (3%) have been named (purple). Minor planets that have been given a number but not a name keep their provisional designation, e.g. (29075) 1950 DA. Because modern discovery techniques are finding vast numbers of new asteroids, they are increasingly being left unnamed. The earliest discovered to be left unnamed was for a long time (3360) 1981 VA, now 3360 Syrinx; as of September 2008, this distinction is held by (3708) 1974 FV1. On rare occasions, a small object's provisional designation may become used as a name in itself: the then unnamed (15760) 1992 QB1 gave its "name" to a group of objects that became known as classical Kuiper belt objects ("cubewanos") before it was finally named 15760 Albion in January 2018. The first few asteroids were named after figures from Greek and Roman mythology but as such names started to dwindle the names of famous people, literary characters, discoverer's spouses, children, colleagues, and even television characters were used. As the number of asteroids began to run into the hundreds, and eventually, in the thousands, discoverers began to give them increasingly frivolous names. The first hints of this were 482 Petrina and 483 Seppina, named after the discoverer's pet dogs. However, there was little controversy about this until 1971, upon the naming of 2309 Mr. Spock (the name of the discoverer's cat). Although the IAU subsequently banned pet names as sources, eccentric asteroid names are still being proposed and accepted, such as 4321 Zero, 6042 Cheshirecat, 9007 James Bond, 13579 Allodd and 24680 Alleven, and 26858 Misterrogers. Names were adapted to various languages from the beginning. 1 Ceres, Ceres being its Anglo-Latin name, was actually named Cerere, the Italian form of the name. German, French, Arabic, and Hindi use forms similar to the English, whereas Russian uses a form, Tserera, similar to the Italian. In Greek, the name was translated to Δήμητρα (Demeter), the Greek equivalent of the Roman goddess Ceres. In the early years, before it started causing conflicts, asteroids named after Roman figures were generally translated in Greek; other examples are Ἥρα (Hera) for 3 Juno, Ἑστία (Hestia) for 4 Vesta, Χλωρίς (Chloris) for 8 Flora, and Πίστη (Pistis) for 37 Fides. In Chinese, the names are not given the Chinese forms of the deities they are named after, but rather typically have a syllable or two for the character of the deity or person, followed by 神 'god(dess)' or 女 'woman' if just one syllable, plus 星 'star/planet', so that most asteroid names are written with three Chinese characters. Thus Ceres is 穀神星 'grain goddess planet', Pallas is 智神星 'wisdom goddess planet', etc. Most detailed information is available from Category: Minor planets visited by spacecraft and Category: Comets visited by spacecraft. ^ Objects (generally centaurs) that were originally discovered and classified as minor planets, but later discovered to be comets are listed both as minor planets and comets. Objects that are first discovered as comets are not dually classified. ^ a b Press release, IAU 2006 General Assembly: Result of the IAU Resolution votes, International Astronomical Union, August 24, 2006. Accessed May 5, 2008. ^ "Unusual Minor Planets". Minor Planet Center. Retrieved 23 December 2011. 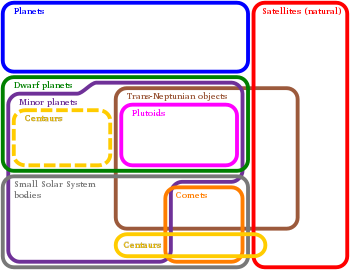 ^ a b c d e "Minor Planet Statistics – Orbits And Names". Minor Planet Center. 28 October 2018. Retrieved 8 April 2019. ^ When did the asteroids become minor planets? Archived 2010-01-18 at WebCite, James L. Hilton, Astronomical Information Center, United States Naval Observatory. Accessed May 5, 2008. ^ a b c "Asteroid", MSN Encarta, Microsoft. Accessed May 5, 2008. Archived 2009-11-01. ^ Questions and Answers on Planets, additional information, news release IAU0603, IAU 2006 General Assembly: Result of the IAU Resolution votes, International Astronomical Union, August 24, 2006. Accessed May 8, 2008. ^ JPL. "How Many Solar System Bodies". JPL Solar System Dynamics. NASA. Retrieved April 8, 2019. ^ "Discovery Circumstances: Numbered Minor Planets (1)-(5000)". Minor Planet Center. Retrieved 2018-12-30. ^ "Discovery Circumstances: Numbered Minor Planets (515001)-(520000)". Minor Planet Center. Retrieved 2019-04-08. ^ Horner, J.; Evans, N.W. ; Bailey, M. E. (2004). "Simulations of the Population of Centaurs I: The Bulk Statistics". Monthly Notices of the Royal Astronomical Society. 354 (3): 798–810. arXiv:astro-ph/0407400. Bibcode:2004MNRAS.354..798H. doi:10.1111/j.1365-2966.2004.08240.x. ^ "Running Tallies – Minor Planets Discovered". IAU Minor Planet Center. Retrieved 19 August 2015. ^ Dr. David Jewitt. "Classical Kuiper Belt Objects". David Jewitt/UCLA. Retrieved July 1, 2013. ^ Schmadel, Lutz. Dictionary of Minor Planet Names (6 ed.). Springer. p. 15. ISBN 9783642297182. ^ "Naming Astronomical Objects". International Astronomical Union. Retrieved July 1, 2013. ^ Staff (November 28, 2000). "Lucy Crespo da Silva, 22, a senior, dies in fall". Hubble News Desk. Retrieved 2008-04-15. ^ 谷 'valley' being a common abbreviation of 穀 'grain' that would be formally adopted with simplified Chinese characters. ^ "Division III Commission 15 Physical Study of Comets & Minor Planets". International Astronomical Union (IAU). September 29, 2005. Archived from the original on May 14, 2009. Retrieved 2010-03-22. ^ "Physical Properties of Asteroids". ^ "The Near-Earth Asteroids Data Base".